Arranged marriages sounds bewildering for the West. They just could not comprehend how two complete strangers could marry one another without having a clue on what he or she is like as a person. 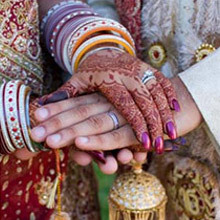 However, research has shown that the tradition of arranged marriages have often proved to be successful. But, there are certain assessments that have to be into account while embarking on this traditional system. Right Age: The generally acceptable age for the bride is to be somewhere around 25, for the groom not later than 30 are considered favourable. Self Assessment: The involved parties must make a certain list on what they expect from their to-be partners and a level of compatibility they desire. Expectations: The level of expectation is quite high in this system. This often results in disappointments on both sides at the end of the day. Concerned sides must know that not all virtues are found in a person and they must be ready to make some compromise. Economic compatibility: Financial security of the bride and the status of the groom have been two important factors in determining economic compatibility between families of both sides. Beauty: Although beauty is an appealing factor for developing the first initial attraction, it is not a guarantee for a successful marriage. It is certainly not to be regarded as the most important issue. All things apart, you are the one who has the last say and must take the final decision of choosing the person you would be spending your life with. Parental pressure should not force you to keep aside your views and concerns as the consequence of such hesitation and indecision would have drastic bearing on your life and on the life of your supposed partner.